The Ride Bezerker had a little tune-up in 2016 with a different shape and some extended camber. It’s a quick turning poppy aggressive ride. We loved the little extra camber and new nose/tail design but felt the side cut was a bit hookey. It seemed like it always wanted to be engaged in a turn and didn’t like to go straight. The 2019 Ride Bezerker still seems to be pretty much the same board as the 2016 model we tried so the old review still stands. Conditions: Perfect Sierra Groomers after a wet storm. On Snow Feel: We all liked the 2016’s ride better than the older models mainly because the extra camber extended further past the front binding towards the nose and got rid of that washy feeling. The only issue was all of us felt it was a little hookey and didn’t really like flat basing or going straight too much. It felt like it always wanted to be engaged in quick short to medium radius turns. That was probably the only reason it didn’t make the favorites list because some will like that feel and some wont. Maybe a little detuning of the edges might help but not 100% sure that would fix the issue. Still it’s a mean quick turning hard carving all mountain ride. If they just dialed back the side cut a bit this would be an amazing aggressive one board quiver. As it stands now some will love this and some won’t. The Ride Berzerker is a very similar ride in specs and feel to the Ride Highlife UL which means it’s the same board without Ride’s ultra light technology. This is a good board for the rider that likes to carve groomers and bomb hills but uses the same board when it dumps. If you can’t afford the Ride Highlife UL which is a better board this is going to be the next best thing. The 2013-2015 Ride Bezerkers are pretty much the same ride. Conditions: Pretty good snow to some ok snow with harder patches here and there. There is a decent amount of rocker in the nose that leads to a very long but not very high camber that goes almost all the way to the tail. Many hybrid camber boards are not like this and usually have a lot of camber between the bindings and equal rocker at the tip/tail. It’s definitely unique so here is our take on how it rides. On Snow Feel: We found the Berzerker to be a typical mid level ride board. It was damp, stable and predictable but not to lively like the High Life UL. Its stable between the feet for one footing and flat basing. It is forgiving compared to a straight camber board but you still have to be on your game. A technical rider that loves camber but would like a little bit less severity if they aren’t on their game most likely will like this ride. It’s for that guy who lives for powder but on groomer days doesn’t like to turn much and bomb the mountain. Powder: This is definitely one of the best qualities this board has and we can tell this even though we didn’t get a chance to ride this in any powder. You can tell by the rocker that starts quickly after the front binding inserts that goes all the way to the nose, the good set back and the longer lengths will be borderline excellent when it comes to powder. It’s one of those boards that many riders will really enjoy in powder. Turn Initiation and Carving– The Berzerker has a bit of a sluggish feel when it comes to making quick transitions from edge to edge. When making longer/wider radius turns this was more fun and you could feel a bit of the camber helping you spring out of the turn. We were a bit disappointed when it came to carving. We thought this would be excellent like the High Life is but the board rode more like a board with a minor taper. We think this was because of the rocker that starts at the front binding. It would kind of wash out if you didn’t initiate the turn more from the back seat but after a little time you get use to it. I think with a little more time and setting up the board more set back over the camber would make it better. Speed: The Berzerker has a pretty good base and a very damp design so if the base was faster it would be excellent at high speed. The typical ride ultra damp feeling was in effect. To us it felt like the board was 1.5 times thicker than it was. Some love this and some aren’t into this feeling. If you are into straight lining then this will be a fun board. Uneven Terrain: It’s on the stiffer side of the flex world so you would think that it’s going to be worse but ride has something going on in the build to create a barrier between you and the bumpy snow beneath you. Edge Hold: We had varied conditions of snow but most of what we experienced was hard to medium pack with some chewed up spots in the traffic areas. We thought the edge hold would be better than it was. We found it to be fine in the better snow but there were some areas where we didn’t feel comfortable laying into a carve in firmer condtions and held back. We would say that this is on the average side of good and we wouldn’t want to rely on this edge in icy or very hard conditions. Flex: This is a medium to stiff flex that makes for a semi easy board to flex but it isn’t very easy to butter around on. The nose is a little easier than the tail because of the rocker but this ain’t no jib park board. Jibbing– This will be ok in the jib park but far from ideal. We didn’t even bother taking it in there. Pipe: This isn’t much of a pipe board either. It was ok but if you like to lap the pipe there are many better boards out there. Jumps: We fount the Berzerker to be middle ground when it came to generating your own air. It doesn’t have the spring that many boards do but its not lifeless either. This will be fun hitting a natural jump at higer speeds and keeping it simple off the kickers in the park but there are many better jump boards out there. All in all we had mixed emotions about the overall ride of the Berzerker. It missed a bit on edge hold, carving and turning but made up for it in powder and speed. So if you are the kind of rider who likes to bomb the hill, ride powder and get out when the conditions are good then you will really enjoy the Berzerker. We try to get as many images of the Ride Berzerker, but forgive us if they're not all there. Great board, Purchased it as an all rounder (have a XV Magtek 72 for those deep big mtn days here in French Alps). Being a tall guy i ride the 67 w. No issues with being hookey (maybe that applies for the wide version only, don´t know). Carves great, pops nice off everything and the nose rocker helps to stay afloat in pow. Great for freeriding and natural jumps. The only downside is that its a bit slow edge to edge in the trees, i would like to have it mid-wide for my size 12 feet and maybe a slightly softer to make it more playful. But thats just me. Overall great board! Height, Weight And Boot Size (for Boards, Boots & Bindings): 6'1 190.95. 15 years riding. mostly big mountain. I have the Berzerker from 2014 in 161. 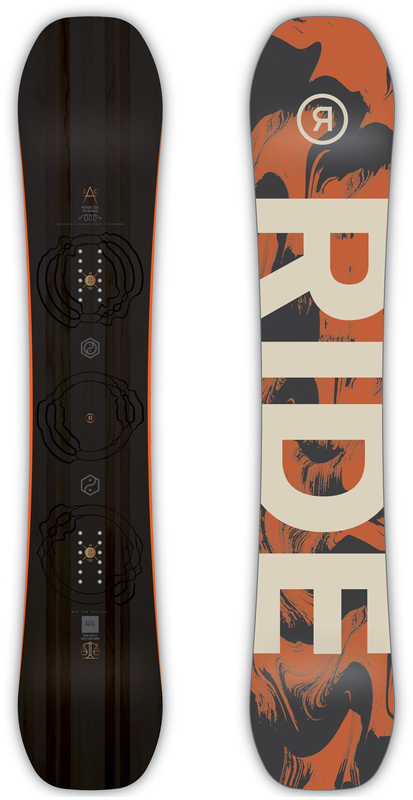 Rode it at Loveland CO an a-abasin at the end of last year paired with B genesis and solomon malumute boots. The bad: Feels dead and plankish. I usually ride stiff boards, but turn initiation is slower than average on this board. Very little pop. Not lively in any way. Feels cumbersome at slow speeds and for whatever reason, the edge hold is lacking and below average. Can't be trusted on high speed turns as it will wash out on hardpack. I'm not sure who this board is for. Perhaps if you straight line all day on soft snow, you'll be golden, otherwise it's one of the least fun and overall worst boards I've ever been on.